This ebook in PDF is one of the few books in the "Almost Free"
category, not the Free category. on last things, one on the Falling Away. part of the world-wide and inevitable unsound doctrine movement. sound teachings of the Bible. 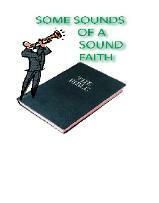 SOUNDS OF SOUND FAITH, Item #1.
on earth before the Second Coming in order to fall away. insure attendance when there is little or nothing there to offer. history before the Second Coming.